Longtime gamers will remember the glut of video game mazines during the early 1980s. Joystik was one of the better offerings of the era. Second in quality and popularity only to Electronic Games Magazine, the mag featured fun articles, psychedelic art, nice screen shots, helpful strategy guides, and informative reviews. Seven of the nine published issues are now available online via PDF format (thanks to Digital Press). Click here to check them out. I found your blog online... 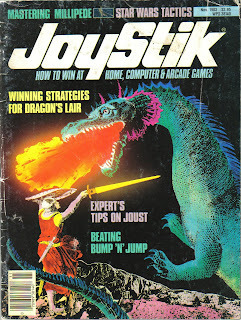 I didn't know if you'd be interested in viewing a recent Ebay posting: Premier Issue of Joystik Magazine (1982). Square Pegs -- Now Available on DVD! Oklahoma Video Game Exhibition 2008!